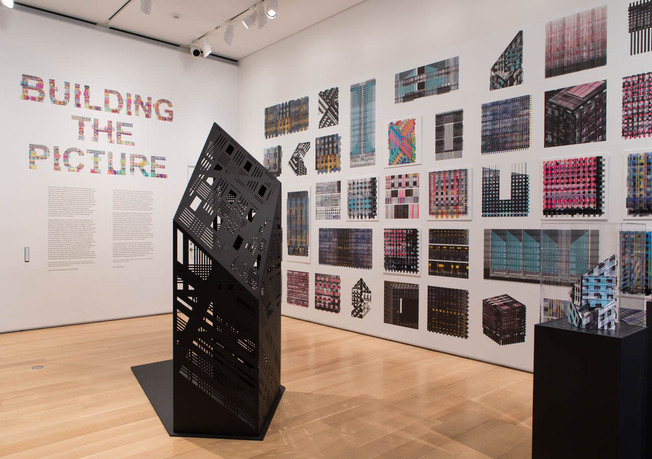 2015 | Art Institute of Chicago, Who Builds Your Architecture? 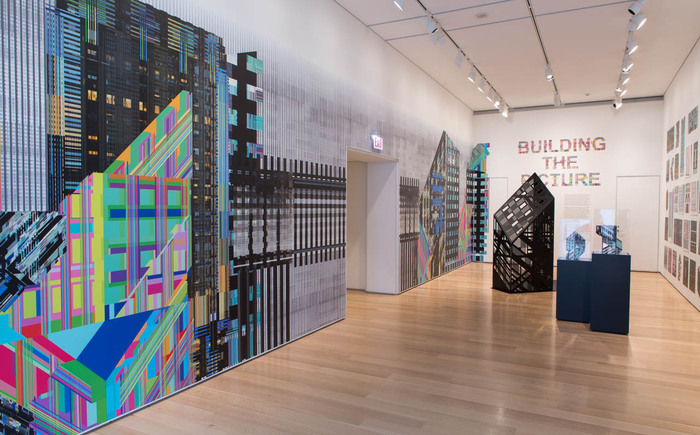 View of Elena Manferdini: Building the Picture, Kurokawa Gallery, Art Institute of Chicago, 2015, Chicago. 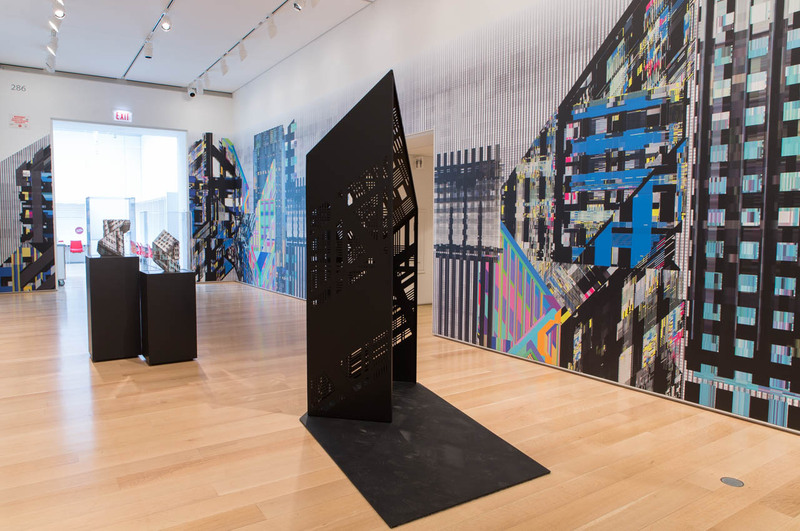 Italian-born, Los Angeles-based architect Elena Manferdini has become adept at creating vibrant architectural installations that employ complex patterns, luscious colors, and rich textures to introduce new spatial and visual narratives to challenge the clean lines and abstract forms of architectural modernism. 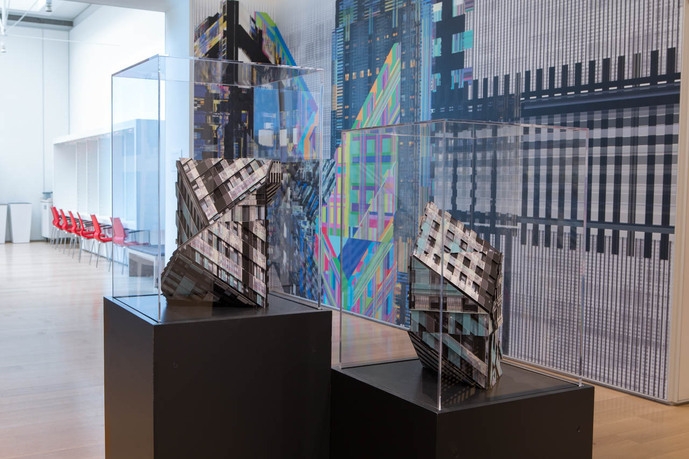 For this new work for the Art Institute, Manferdini draws inspiration from the iconic orthogonal geometries of Mies van der Rohe’s designs, including his 860–880 Lake Shore Drive apartments in Chicago. By digitally manipulating images of this internationally recognized building, whose structure is an ode to Chicago's strict urban grid, Manferdini creates an immersive environment built off this design. Although the image is rendered in two dimensions, the play of light, color, depth, and perspective invites the user to experience the work up close, as well as from a distance. Elena Manferdini, principal and owner of Atelier Manferdini, has over fifteen years of professional experience in architecture, art, design, and education. She is a licensed engineer in Italy, and a licensed architect in Switzerland. She received a professional engineering degree from the University of Civil Engineering (Bologna, Italy) and a master’s degree in architecture and urban design from the University of California, Los Angeles (UCLA). Manferdini currently teaches at the Southern California Institute of Architecture (SCI-Arc) and is the coordinator of their graduate program. She also serves as the Howard Friedman Visiting Professor of Practice at the University of California, Berkeley, and has held visiting professorships at Cornell University, the University of Pennsylvania, and Seika University. Karen Kice is the Neville Bryan Assistant Curator in the Department of Architecture and Design at the Art Institute of Chicago. A researcher, writer, and curator in the field of architecture and urbanism, Kice received her BFA in art history and ceramics from the Kansas City Art Institute and her MS in architectural history and theory from the Bartlett School of Architecture, University College London.